All Latest Repo – Nginx Extras, Percona MySQL 5.7 Plus Manual Steps on Fail. Here is Nginx WordPress Ubuntu 16.04 Auto Install Bash Script. It is written like poetry from the detailed manual Nginx WordPress 16.04 LTS installation guide. Written like poetry means – I have NOT Tested. Auto Install scripts should be simple. That it is. Those Easy Engine, CentMinMod are basically not good and can add such an odd error, they may end up failing and keeping a backdoor. Most importantly, none of them address many issues of WordPress like Error Connecting Database. Easy Engine is worst, not installing normal apt package of Nginx Extras, normal paths are not practical for a new user. Writing million of lines in Python for one WordPress installation on one Cloud Server is impractical. Indeed, for LAMP server there is apt install lemp^ or apt install wordpress commands for Apache2. New users need not to use so complex method for only installing simple WordPress. Nginx is not exactly easy to handle by a newbie. Most importantly, cPanel to OpenStack has options of some sort of automation. First, this is the detailed manual Nginx WordPress 16.04 LTS installation guide. The script is written to automate it. 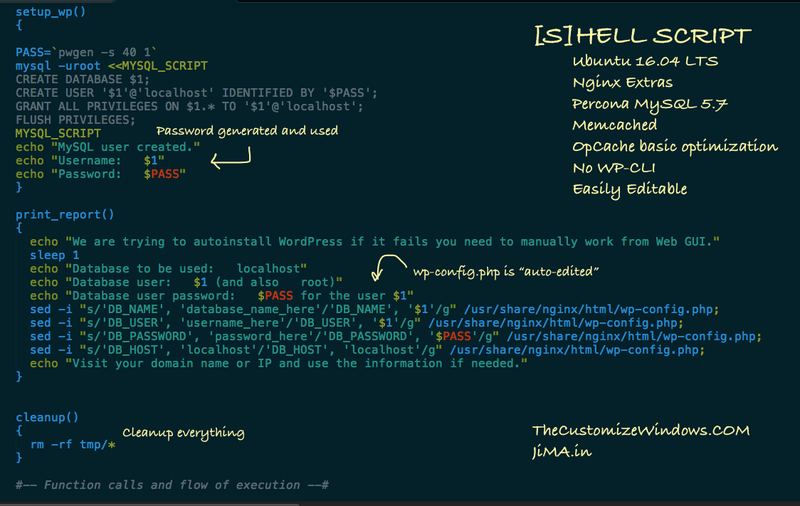 Here is GitHub repository of Nginx-WordPress-Autoinstall-Bash-Script. +--- main.sh # main file | +--- tmp # directory with settings files to copy | +--- files # WordPress Plugins like W3TC plugin specific files. +--- files # WordPress Plugins like W3TC plugin specific files. We could use only main.sh but such structure may help others to modify. Here are the tagged releases – Ubuntu-16.04-Nginx-WordPress-Autoinstall-Bash-Script/releases. If you get error then report bug or send pull request on GitHub. I will check the script manually later and add video. This Article Has Been Shared 1871 Times! Cloud Computing Service Providers can hide the real cost by showing only the cost of computing power usage in advertisements hiding the cost of bandwidth. Cite this article as: Abhishek Ghosh, "Nginx WordPress Ubuntu 16.04 Auto Install Bash Script," in The Customize Windows, June 10, 2016, April 23, 2019, https://thecustomizewindows.com/2016/06/nginx-wordpress-ubuntu-16-04-auto-install-script/.